That’s right! The birthday giveaway I promised. Red Heart was kind enough to sponsor not just a couple skeins of yarn but 7 skeins! Better yet, it’s the new super saver ombre and stripes yarn. If y’all haven’t tried it out yet, this is your chance! Thank you Red Heart for sponsoring this giveaway! This Birthday Giveaway is only open to the United States addresses, and ends 8/26/2017 at 12:00 am Eastern US time. Your email address is the only mandatory entry, and is not added to email lists (I hate when that happens too). Prize will be given to one lucky winner. To enter use the form below the photo. Good luck, y’all! ? January birthday perfect for new hats in NH! My birthday is August 30. My birthday is Nov. 28th so I am a fall baby, was almost born on Thanksgiving , my Mama made it till after midnight before I was born, BUT, just a few seconds after midnight, so barely missed it. I would so love to win this, I could really use the yarn to make me something awesome for the cold weather that is coming my way . Need all I can get to stay warm , since I am on a fixed income and can’t afford to pay really high heating bills. Crossing my fingers, toes legs and even my eyes. Anything else you can think of for me to cross for luck. LOL. GOOD LUCK EVERYONE, even though only ONE can be the really blessed person. My birthday is in the spring! My birthday is in June! Summer! My birthday is in the winter. Happy Birthday to you & thank you for the chance to win. My birthday is in the Fall season. One of the best season because of Halloween. My kids get so excited that time of the year. Dressing up, candies, pumpkin picking, corn maze and more candies!!! Love it! I have a Winter birthday! My birthday is on the spring and often hits mother’s day…my birthd9 is May 12. My birthday is in the summer! June 26th! My birthday is in the summer! Thanks for a great giveaway! My birthday is in the Fall. My Birthday is in spring. My birthday is in October with all the wonderful colors and smells of autumn. My birthday is June 12th…..in the heat of the summer! My birthday is in September…less than 2 weeks away now??? My birthday is right at the end of the school year, beginning of June. My birthday is Christmas day, 1955. Love being born on the Lord’s day!!!!! My b-day is in January. Would love to be able to use these gorgeous yarns! My birthday is in winter, Valentines Day to be exact. My Birthday is in Spring and these colors are beautiful! My birthday is in a couple weeks! Yippee! My husband’s, my aunt’s, my dog’s, mine, and my 8month old third daughter’s birthdays are all in December!! I am currently working on a blanket for our newest edition like i did for the older two daughters. I am also teaching them how to crochet!! I love red heart it is the best!! I love these colors and they would macth what we already have started so we really hope we win!! in fall…. is the most wonderful time of the yeeeeeear!!! My birthday is in the fall!! My favorite season! My birthday is in the spring. Those colorways would make a great gift, along with time to finally make something for myself! My birthday is in the summer. Would love to win and make a blanket. My birthday is in spring. I love having a May birthday. Fall (maybe winter depending on the year). It’s actually Nov.
My birthday is in June. Would love all these yarns. I love red heart. My Birthday is in September.. Fall usually begins the day after my Birthday. I have a winter birthday. Great crocheting weather! First time I have been to your site. Looking forward to exploring it more. I think it’s winter or fall? I’m never 100% sure if Late November is one or the other lol. My birthday is in winter. The day after valentines day! My birthday takes place during the summer in the Northern Hemisphere. Thank you! What a wonderful prize. Generosity abounds in this craft, God bless you . I am a spring time baby. I’m a winter girl born in December. In the summer… always hated not having it during school with friends. My Birthday in in the Fall, the day before Halloween. Summer! Actually, my birthday was yesterday, 8/22, yah! my b-day is in the fall in Nov.
Winter 😀 My birthday is in December. My birthday is middle of July. Love these colors! Thank you! My birthday is in the summer. Summer fun! I love Red Heart yarn! So many beautiful colors! My birthday is in May! Thank you! I would love to win this!! My birthday month is February! I have a summertime birthday. 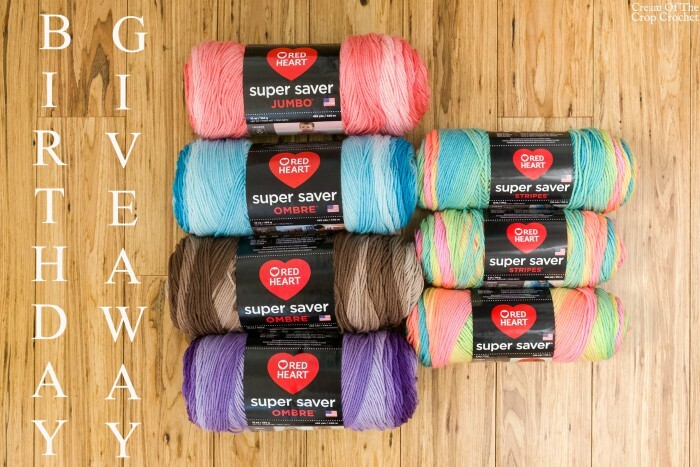 I love the colors of the yarn and I would love to win, my birthday is september 30….. thanks for the chance to win !! My birthday is late spring, May. This yarn is beautiful. Just found this soon so excited to see more. Very pretty yarn…i need some more Red Heart yarn in my stash…and on my hook! My birthday is in the Fall – Halloween, to be exact! My birthday is in the spring! I love spring and summer. Red heart is my go to yarn been using it over 20 years. I am a Autumn lover., love everything about it. My favorite colors are the colors of Autumn. Was born In November right around Thanksgiving. My birthday is in November – fall season!! Love it!! I am a Christmas Baby – When I was young – I complained about loosing out on birthday parties and fewer gifts. Mom said I was born in the month of the Angels so that made me special. Special people don’t worry about the other stuff. Now I am much older and wish I did not have a birthday. My birthday is in winter! February ! My birthday is in summer in fact it’s Sunday. This would be a great birthday gift!! My birthday and my daughter’s birthday are in September. It would be incredible to win this stash so I can make her something incredible. Thank you for the chance! My birthday is in Summer – August 12. This would be a wonderful belated birthday gift! My birthday is November 23. My birthday lands on Thanksgiving every once in a while. My birthday is in the spring. my birthday season is winter and I love crocheting during that season … warm afghans, scarves, shawls, etc. In the warmer seasons, I crochet smaller things like dishcloths and light scarves. My birthday is in summer, July 29. I have been crocheting since I was a teenager, and live to make all kinds of things. I hinted at yarn for my June birthday… didn’t get it. 😉 Love that purple! My birthday is September 19th so I’m just shy of fall. 🙂 Thanks for the chance to win these gorgeous yarns! My birthday is June 1st I love to crochet things I am working on blanket need more mixed colors to complete it. My birthday is In June, I love the fall though! Winter which is my favorite! My Birthday is in November…I’ll hit the Big 7-0! My birthday is in the summer. August 29th – next week. my birthday is in the summer…. I have a Fall birthday, which is my favorite time of the year! My birthday is in the winter technically but I consider it more spring. It’s in early March. My birthday is the end of December, so winter it is and over the Christmas holiday. My season is Winter… December! and I love Red Heart Ombre yarn!! My birthday is in September . I love the fall and all the beautiful colors that go with it. My birthday is in the fall, October! My brithday is in winter! My birthday is in the summer. Usually the hottest day of the year! My birthday is in June – right at the beginning of Summer. The colors are wonderful! My birthday is next month! September. I live in Maine and to a lot of knitting, some for friends and family and I knit for various charities. I’m a late winter baby – February. Thank you for the giveaway !!!! I was born in Winter, never got to have a pool party, was just happy if it didn’t snow to much for guests to come. I am a spring baby and these colors go right along with me. Love them! I’m a summer baby! Kinda. Usually. The weather in my hometown is so unpredictable, you could say I was born in all seasons, lol. My 10th birthday was supposed to be a pool party, as it had been a nice 75-80 degrees all week, and when the day came around, we got a foot of snow. I was born in the spring, in April. Only problem I had was that, being in MI back then, it rained on my birthday almost every year ?. I am also a Monday’s child, which means I am fair of face. Thanks for your site. I am a late spring baby and have been crocheting for 48 years!! This would be a great birthday present. Today is my actual birthday. I am a heat of the summer baby. But love to crochet in those winter months. My birthday was in June. What an amazing offer to celebrate ? My birthday is in the fall. Love your site. Born in the dead of winter! My birthday is in Spring. When I was younger I used to love it, specially when it fell on a school day. Now however, that I’m older I have to deal with allergies. But I still love it though, shows me that nature is alive. Birthday is in March and the stone is aquamarine (blue is my favorite color) – and I’m a Fall/Spring kind of person. My birthday is March 4, 1991 ? My birthday is in the fall. 10/21/1975. My birthday is in Winter. My birthday is in the Spring. I was a May Day baby many, many moons ago. Thank you for the opportunity to win such beautiful yarns. God bless! Born in winter but I love spring. December 23 for me, and no, I don’t mind now that I’m older, too busy to notice anymore. My birthday is in the winter months – January. Summer! My birthday is today! This would be fabulous to win. I cannot find the RH Ombre anywhere! My birthday is in the summer season. My birthday is in the winter – 4 days after Christmas! I am a summer/fall baby. My birthday is in a week and a half. SUMMER…August 31st…coming soon just like the end of summer!!! thanks for the entry! My birthday is in June! My birthday is in February so winter. My birthday is the day after Independence Day… July 5th,,,, summer time. My birthday is in the summer time, as I just had my birthday on August 4. Thanks for this opportunity as I love to crochet. My birthday is on May 10th, so in Spring and one of my 2 favorite seasons. Spring and Fall are the best seasons we could have. My birthday is in the summer – I just had it a couple weeks ago on the 12th. My birthday is in the middle of fall. My birthday is in the dead of Winter! The best time to crochet! Happy Birthday, mine was the 18th. I’m an autumn birthday girl – would love to win this prize! My birthday is tomorrow ? My birthday is in January so winter. My birthday is in September, so fall. Thank you for this opportunity! Spring jun e baby here! My birthday is in the Winter! I’m a december baby so lots of warm goodies to be had with this scrumptious yarn! How nice! My birthday is in the Fall, 10/10. Happy birthday and you’re welcome! My birthday is in winter! What a wonderful gift, for a December birthday! Thanks for the opportunity! My birthday is in August….I have been crocheting since I was 9, but would much rather crochet in colder weather, especially if I am doing an afghan or bigger project….,I would LOVE to try these new yarns by Red Heart….I can’t buy them locally….Ty for entering my name in for a chance to win!!! My birthday is in July so I would say that season is summer! Love having the summer birthday cause it was fun to be able to celebrate with friends off from school. These new skeins look interesting and will make some cute afghans and hats! My birthday is coming up next month!!!! I actually celebrate two birthdays – the day I was introduced to the world and the day my cancer was removed. I’ll be celebrating my five year cancer birthday a couple weeks after my birth day. Spring May 6, 1950 ooops, hahaha Thank you for letting me be part of this great site. Angel hugs and happy hooking…. My husband’s birthday is today August 22, but mine is in February. I love to crochet when it’s cold so I can lay my work on my lap and let it keep me warm, luckily my husband likes to keep the thermostat on low all year long. August 26 birthday, love end of summer/fall! I’m an August 1st baby! My birthday is in my favorite season, Autumn. I was born on November 1st at 12:31am — I missed Halloween but 31 minutes. ? My birthday season is Autumn, and this would make an amazing present , as I crochet blankets and donate them. Late summer/almost fall. September baby! My birthday is considered to be Fall. My birthday is a thanksgiving time bday. My birthday is in winter – February. I’m a winter baby and the oldest of 8. I hope you have a wonderful birthday! Thank you for this give away!!! I’m a summer baby! I found a few skeins at Wal-Mart and I can’t wait to use them! Fall, lovely weather for projects. 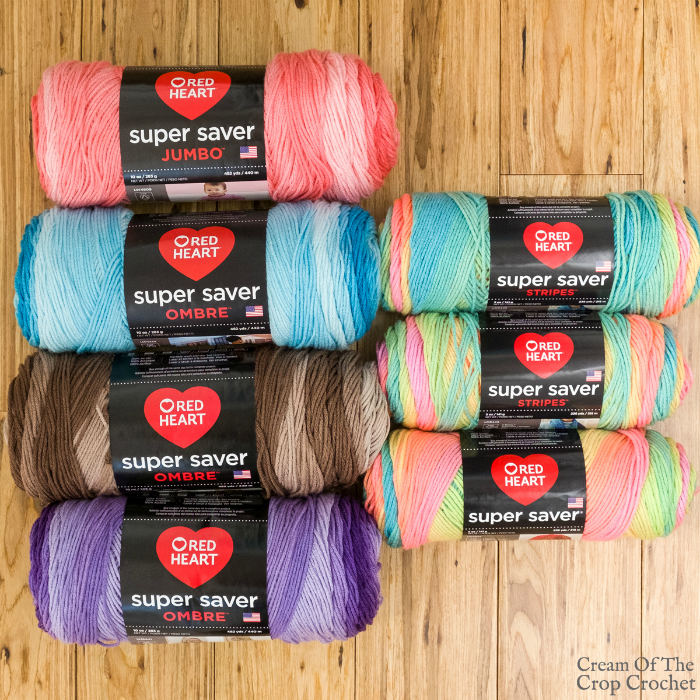 Super saver ombre is beautiful! my Bday is right after New Years, and it’s horrible. everyone is broke and partied out. My birthday is August 11th, so that would be this season, Death Valley Season! LOL JK. Summer is my season. August 30 is my day! This would be the best belated birthday present ever , my bday was August the 18th…..
My birthday is in summer. Looking forward to exploring your blog! My birthday was last month. My birthday is in the fall, the month of October. My birthday is in the fall during the month of November. My birthday is in the fall (October). My birthday is in winter, at Christmas time. I love having a December birthday. I’m early winter. December birthday here. My birthday is this month! My birthday is in July. My first grandchild is due in Dec so I’m super excited to crochet him blankets and slippers! Birthday is in early summer. My birthday is in January, so if I were lucky enough to win this terrific prize, I would have lots of time to make myself something very special! Thank you for the birthday drawing!!! Late Late Fall 🙂 and I do love Fall the colors are so vibrant as the season changed over – by my birthday all the leaves are already gone but I am in awe every year – year after year – at the spectacular colors of Fall. I love these awesome colors. I wish my Walmart at Murray Ky would get them. I crochet year ’round. Red Heart is my favorite yarn. Love Red Heart products. Fingers crossed as I have multiple afghans to crochet for gifts! My birthday was the 8th of August.. and I had to work. lol No ice cream for me. My birthday is this week the 24th ? My birthday is this month, August !! I love the colors of this yarn !! And i love your red heart yard. Mine is in winter ! ? Mine is in the summer! Perfect for crochet time! Thank you. My birthday is in April, so Spring is my season. Love hat patterns and Red Heart is my ‘go to’ yarn. Plus, my birthday is coming up the first week of Sept., last of the summer. My birthday is in the hot summer month of August!! August 28th!! My birthday is in august? My birthday is the last day of October. would love to win this yarn, thanks! My birthday is in the summer at the end of July. Between Halloween and Thanksgiving so I would say The Great Pumpkin Season! Love these Red Heart colors. My birthday is September 5th and I would love to spend the day doing my favorite hobby. My birthday is in the summer, July to be specific, but I hate the heat of summer and wish it was in the fall instead. my birthday is Dec. 31 and we have only seen a few of the new colors here but they are awesome ! My birthday is in the fall. October. My birthday is at the end of winter. My Birth is the end of May. My birthday is two weeks before Halloween. My Birthday was July. I would love this give away, because I Love to make Baby Blankets and give them to a special person having a new baby. My birthday is next month just before the official start of Fall! My birthday is in the spring, April to be precise! I’ll be turning 21!!! My birthday is in fall (October). My birthday is in the winter. What a fantastic giveaway! My birthday is near the end of Winter! My birthday is in the fall and sometimes is on election day! If I by some crazy chance win I will share with my sister, who always has a project going. Hello, thank you for all that you do, I am new to crocheting and my daughter-in-law just learned to knit. My birthday is March just a week after spring but I love the fall and winter colors. My birthdays in the fall, day before Halloween!!! My birthday is in April. These yarns are so pretty, I would love to make something with them! My birthday is in summer – August! Birthday is in the fall so coming right up! I Love Redheart yarn. Thanks for the opportunity. My birthday is in the winter, on December 30th. My birthday is today, August 21st. I am a late summer baby. W I N T E R !!! Mine is end of summer beginning of fall. Spring when everything is so new and fresh. My birthday is March 1st. So beginning of Spring. I would solove to win these beautiful skeins of yarn. I have a extremely rare Disease and will be off my feet for months, so this would be so awesome to win. Thanks for the Chance to win ? I have a fall birthday! My birthday is close to Christmas!!!??? My birthday is in November ~ fall ~ but I love all these colors!! Thanks for the opportunity! My birthday is June 17, so I’m right on the line between spring and summer! Thank you! My birthday is in summer. My birthday is in Autumn! Thank you for the chance to celebrate your birthday with you and some yarn! My birthday is in the Spring. I was born on Easter Sunday. Spring B-day but LOVE Fall!???? My birthday is in the spring. I crochet everyday, even though I broke my wrist. I will find a way to continue, a little awkwardness never bothered me. I am anxious to try the new Red Heart yarn, Thank you for the chance. My birthday is St Patricks Day. Hope I’m lucky! My birthday is in winter and I am looking forward to making many gifts for family and charities. I’m a summer baby, end of June! My birthday is in January….a total winter baby!! My birthday is in the fall! And fall is also my favorite time of year! My birthday is in the Fall,either just after or just before thanksgiving. Depending on the year ? My birthday is in July, SUMMER BABY!!! My birthday is January. New Year, New birthday! My birthday falls in winter. ? My birthday is at the start of the fall season just in time for afghan projects. Fall Birthday! Thanks for the contest give away. My birthday was 10 days ago. Love these colors. Thanks for the giveaway RedHeart. My birthday is in the beautiful fall season. September 15 🙂 thank you so much for this wonderful giveaway. My birthday is in fall, just a short few days ahead of Halloween! Edge of spring and summer. End of March, usually the day right after the first day of spring. That’s so fun, and thank you! 🙂 Have fun! Thank you and you’re welcome! 🙂 Oh, happy birthday! September 5th! Coming up very soon! What a lovely bunch if squishies! My birthday is in May…..spring. Happy Birthday!!! Thanks so much for the opportunity! Hoping to win since this month is my Bday month as well ?. I could not find the entry form but I celebrate a winter birthday with my twin sister. I’m a June baby and love to crochet with lovely pastels and brights. Mine is at the end of winter! My Birthday is in July. Middle of Summer. My birthday isDecember 4, exactly 3 weeks to Christmas! My birthday on September 14th which is soon! I’m a Valentine’s Day baby, ❤ that’s what makes me so sweet! ? ? Winter season love to crochet then !! My season is sometimes menopausal. I’m early September so it can either be REALLY hot or fall like. Summer season, but I love the fall/winter most! My birthday just happened on August 12th and 7 skeins of Red heart would be a great belated birthday present.?? My birthday is in the summer….on the 45th of July!! My birthday season is fall. I saw your blog on facebook (from the red heart giveaway post) and I’m so excited to check more of it out! I LOVE CROCHET BLOGS! Happy Birthday! Starting off Autumn with my birthday. My bday is in Winter. End of summer. Beginning of fall. My birthday is In the Fall – Nov 23. Right at Thanksgiving time. I love the Fall!!! My birthday season is Summer and in two days. My birthday is in June when the weather begins to get warmer in Central NY! I have a winter birthday. My birthday is next week! 8/28. So excited! My birthday is in the Fall. September. Winter! I’m a December baby! Yarn is perfect for my birthday season: January baby here!!! This caught my eye because today – August 21st IS my birthday! Plus everyone is celebrating today – the solar eclipse! Plus I love Red Heart yarns! So I’m three for three!!!!! My birthday is in the summer! I’m a July baby ?. My birthday is in September; the fall of the year. I always look forward to the crisp, cooler weather. September. Perfect for crochet blankets! Winter birthday ( Christmas Day ). I love this new ombré yarn. Lovely give away. My birthday is in October, so that would make a nice gift! Happy knitting!! My birthday is in October, one of the most pleasant months of the year! My birthday is in Fall, but most of the time it feels like Winter. I’m celebrating my birthday in December. Perfect time for tea and a DIY-project. The new yarn looks neat. My birthday is in November…..ready for the Fall in all the autumn colors! Love the ombre yarns. My bday is April 15th ? Summer….I can’t wait to try this yarn! Winter. Perfect for cu doing up and crocheting. My birthday is in Spring – May 31st. My birthday is in March. Nice time to make light sweaters. Love the stripes. I would love to try the ombré. November birthday. Winter time. Perfect excuse to crochet afghans! My birthday is in the summer! Birthday Giveaway is just in time for my birthday, August 23. Lately when asked what I want for my birthday I just say yarn. No longer need anything else. Yarn makes me happy. I also use Red Heart Super Saver quite a bit. My birthday is August 2 1965.. Learned to crochet when I turned 50. Happy birthday! My birthday is in Autumn (and I LOVE Autumn)! Lovely giveaway! My birthday was August 5th. My mother always makes fresh strawberry bread for me every year. Yeah… I’m greedy with it, too. I would love to win this! Been looking everywhere for it. My birthday is aug.29th…always seems like just another day. In the winter season! January. My birthday is June 8th, which is spring! Cream and Crocheting for the Holidays!!!!! My Mother, Late, Aunt and Late Grand Mother crocheted, and I credit them for my love of crocheting Shawls, and Afghans and things for my Family and My Church Family as well!!!!!!!!!!!!!! My birthday month is December!! May is a birthday month! Emerald is stone, I’m off to see the wizard!! Summer. It was actually last week. Thanks for the chance. My birthday is in May, typically the weekend after the fishing opener. Every year, my husband and I take some time off and go fishing with my grandpa. At night, I crochet while they tell lies about their fish and tend the fire. I have a spring birthday. Would love to use these colors!! My birthday is in September, so beginning of Fall/Autumn. Birthday is in October. Since I’ve moved to hot, humid Missouri, Fall is my favorite time of year! I’m a September 25. End of summer but transitioning into fall! My birthday is in May. So my day lands in spring. When everything is in bloom. My birthday is in November. I’m a happy fall baby. I need more hats to wear and a yarn to match my birthstone. Open to suggestions! My birthday is in exactly 10 days! This would be an awesome present!!!! I have a February Birthday. I was born in August! So, summer is the season that I was born. ? My birthday is June 18 and I claim summer too! My birthday is in July! Fireworks and watermelon. My birthday is in Fall. My birthday is in the fall. I love the changing of the color of the leaves. Winter. Much prefer cold weather to hot! I always have a crochet project on my lap to keep me warm….besides, if it’s cold you can put more on, but there is a limit to how much you can take off…apparently…heard it from a friend ?? February it’s my birthday month! My birthday is April, so spring! My birthday is November 12th. I love working in the ombre colorways but also like using shades to make fun depth patterns too. Thanks for the giveaway! Love your site! My favorite season, Fall! My birthday is in October. I love all things halloween!! I’m a winter baby, and was my mom’s early Christmas gift. I was born December 23rd. September 15th baby right here! Perfect time for shawls and pumpkin everything! My birthday is in March, so I’m a spring girl. I LOVE when spring rolls around and the landscape starts to green up and flowers emerge! Winter is so dreary. I was born in January so I am a winter girl who doesn’t like the cold. So I crochet a lot. It keeps me warm. My birthday is actually tomorrow! I was just looking at this stripes yarn at the store yesterday! Can’t wait to try it! My birthday is in February and I’m hoping my baby girl’s birthday will be any day now! October! The best season ever ??? September girl here. Labor day baby. My birthday is the 6th of September. (Just before Fall). This would be an awesome birthday present! I’m a late summer baby. I’m a spring baby, March! My birthday is late summer. My birthday is in summer! My birthday is a Winter month so it is also my favorite time to crochet a nice warm blanket for the ones I love! I’m a winter baby, February. But SE Texas has the best winters!! My birthday is August 31!!!!!!!!!!!!! I can’t wait! My birthday is in Spring! My birthday is March 1, so sometimes it’s winter and sometimes spring. Even though my birthday is in January, I have plenty of other people’s birthdays I need to make presents for! I am a winter girl! My b-day is 9-4 I would love some new yarn for my birthday ????? Happy Birthday ! mine is Friday !! <3 Happy Eclipse day as well !!! Yummy colors makes it a joy to crochet! My birthday is August 27th! My Birthday is in March!!! Technically my b-day is in the spring (June 18) but I claim it’s in summer! LOL! I’m a summer lady! Born in June. Happy, happy birthday, Ashley! Technically born in the summer, early September, but really a fall girl. My birthday is the 15th of November. Love the fall & winter. Im an October birthday and can’t help but to learn new stitches and hook everyday! I have the coral and love it. Will try the others later. I’m a spring girl…April. When I “had my colors done” (remember that? back in the 80s?) I found out I was a spring girl there too! That’s fun! You’re right we do relate a bunch. 🙂 You’re welcome and have fun! I didn’t try it before and nice to try it. Thanks for your lovely heart. I’m a winter baby! Thanks for this AMAZING chance! Fingers crossed! Summer. Just celebrated my 50th. Celebrated probably isn’t the right word. I’m a fall baby ? November. Thank you for this awesome giveaway! I’m a winter kid! 12/11/59. Exactly two weeks before Christmas! My birthday is coming up quickly…September baby here and I would love to try out the new ombre yarn from Red Heart!!!! Happy giveaway!!!!! Good luck to all!!!!!!!!!!!! I’m an August girl, my birthday is on the closing date too 🙂 My daughter’s is the 27th as well so both august babies and I’m teaching her to crochet. I am a July summer baby. I love to have these yarns …………….? ? I am a December(winter) baby! My birthday is in May and sometimes falls on Mother’s Day. Thanks for the chance to enter. My birthday is in the Fall. My favorite time of year! This would be great for birthday gifts. I am a september girl, fall is my season !!! August summer baby 🙂 Love this yarn! I’m a summer baby as well! Winter! Jan 2, just after new years! I’m in September, so very end of summer! I’m a summer baby. June. Thank you for hosting this give-a-way. My birthday is January so winter is my season. But I’m looking to make myself a big comfy blanket to keep me warm in these wyoming winters, so I’d love to win. I just wanted to say also, I so relate Ashley. I can’t classify my style because I love modern with rustic charm, all music, every craft and hobby, I’m just all over the place! I’m 22 and teaching myself to crochet now. 🙂 thank you for this giveaway. My Birthay is in April, so sping is my season 🙂 Thank you for this giveaway! My Birthday is in the Spring – May. My birthday is in November, and I would so love to win that yarn. I would love to make myself a nice new blanket for winter. I am sure it would help knock the chill off the arthritic bones when the snow is falling and the wind is howling. I am crossing my fingers, toes, eyes, and everything else I can cross. Spring baby here, I was born in May! Here’s hoping!! Good Luck Everyone! November … fingers crossed – LOL! I love to crochet, and my choice of yarns are ALWAYS Red Heart, I find it is the best Quality.. I love making Baby blankets of just blankets to snuggle up with on the sofa I also Love the Doilies and I have made several for my home and plan to pass them along to my daughters.. Thank you For your Contest, can’t wait to see who wins>> Good Luck EveryOne!! Mine is in March, so still cool enough to wear all my warm crochet items ? My birthday is in Summer! Have a great Summer!! Thank you!! My birthday is in March – beginning of Spring. Happy Birthday! May your life be filled with many blessings. My Bday is in winter time but living in northern Cal, we’re lucky if we get rain! My b-day is January. Would love to try these varied colored yarns! They look gorgeous!! My birthday in in June. I’m so happy to find your page!! And the giveaway was a bonus, thank you!! Thank you for the chance to win. Such a great prize. My birthday is in December, but I live in Texas so sometimes it doesn’t really feel like winter. Last year I was wear short sleeves on my birthday. I just had my birthday a few weeks ago….in the heart of the summer! my birthday is in early autumn, September! Thank you for the chance to win 🙂 my birthday is in the wintertime. July birthday! Can’t wait to check our your site! I’m new to this website and I love it! I’m a summer baby! My birthday is coming up actually! I love Fall! I love the Stripes yarn, but unable to find it in my town. My birthday is in late winter, March. I never know what kind of weather we will be having. Here in Ohio if you don’t like the weather one minute, just wait, it will change. I’m a summer baby, in fact this past Friday was my birthday! Would be cool if I win this as late birthday gift! My birthday is in June, but love these colors! Spring, I think, lol. It’s March. My birthday was last week. So I guess it’s late summer season. My birthday is in the summer, July.